Hands up. 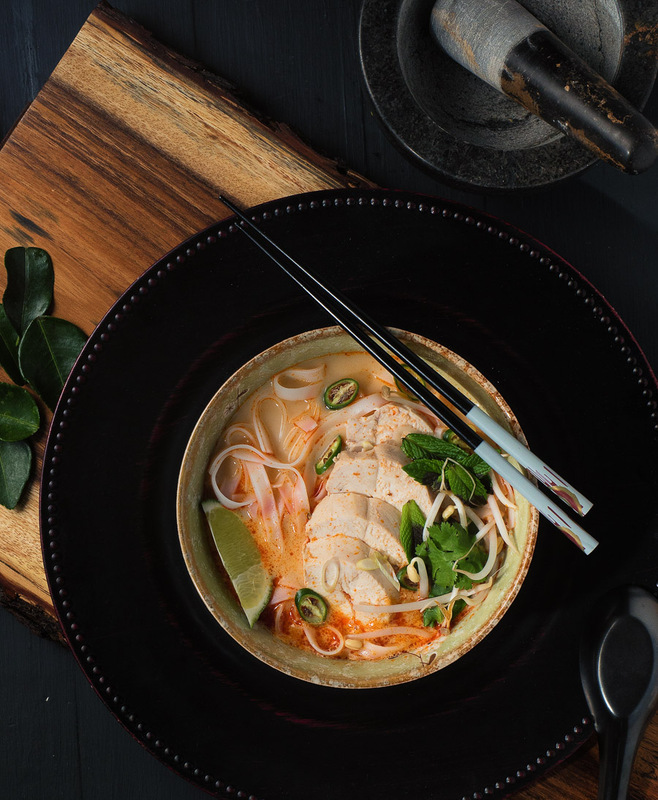 Who doesn’t love brothy Asian soups? Who doesn’t love Thai red curry? 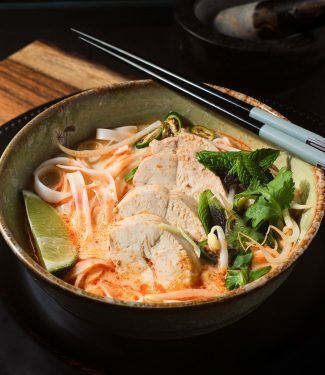 If your hand is still down Thai curry noodle soup is for you. It’s not complicated at all. Weeknight simple in fact. Some chicken stock. Coconut milk, A bit of Thai red curry paste and a pot. Chicken if you want it. Noodles of course. Kaffir lime leaves if you can find them. They really do lend a little something special. Not a deal breaker though. After that it’s all about the garnishes. Mint. Cilantro. Green chilies. Whatever you like. This isn’t baking. There’s no penalty if you deviate from the recipe. It’s a guideline. Go with what you like. Hotter? More chili paste. No lime leaves? Roll with it. You’ll live. Take this where you want. Where you feel like going. Thai curry noodle soup. Make it your own. Pour boiling water over the noodles. Let stand until soft. Rinse under cold water. Heat the chicken stock, fish sauce and kaffir lime leaves in a medium sauce pan. Poach the chicken until just done - 160 for breasts, 170 for thighs. Use your instant read thermometer. Slice the chicken into bite size pieces. Heat a splash of vegetable oil in a saucepan large enough to hold the reserved cooking liquid and coconut milk. Add the curry paste and fry briefly. Add the coconut milk and cooking liquid and bring to a boil. Taste for salt and add more fish sauce if required. Warm the chicken in the simmering coconut milk broth. Rinse the rice noodles in hot water if they have cooled. Mound the noodles in the middle of the bowl. Top with chicken and ladle broth overtop. Garnish as you like. In main course, noodles, poultry, soup, thai. Bookmark the permalink.